Cyclists now outnumber cars in some parts of Dublin according to a council official, with a further massive swing towards cycling predicted. 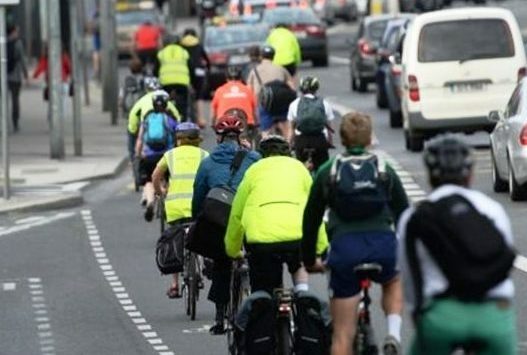 Cyclists have begun to outnumber general traffic in some areas of Dublin city and the trend is set to “massively” accelerate, according to Dublin City Council. At a hearing of the council’s Central Area Committee this morning, Tuesday, Dublin City Council ‘s head of technical service Brendan O’Brien revealed that on Arran Quay along the bank of the River Liffey cyclists outnumbered cars. This change had taken place in the period since 2013-2014 when the council first began to properly develop plans for the two-way segregated cycle lane down the quays. The cycleway, which will run for 6km from the Phoenix Park to the East Link Bridge, will finally commence construction next year. And told Mr O’Brien said that since the council had begun very closely studying road user flow it found the number of cyclists using Arran Quay had increased hugely while the number of cars on the same route had fallen by one third. And when the segregated cycleway was finally in place, he expected a massive further increased in cycling there. “The number of cyclists in this area, since 2013, had increased by 66 per cent. The numbers of cars had fallen by 32 per cent,” he said of Arran Quay, which runs from Mellowes Bridge to Fr Matthew Bridge. He added over the same time the number of Dublin Bus services had increased by 33 per cent, meaning the “sustainable modes” of transport were now dominating. Mr O’Brien add plans for the “segregated cycle track” had proven “a difficult project” since 2012. However, it would be next year before construction began. He said it was difficult to find a way to fit the segregated two-way cycle path at Arran Quay. And while some measures, such as detouring busses away from the quays and into local streets, had been considered there were “issues” with those measures. So what was now proposed was that the footpath would remain, the bus lanes would remain and the cycle lane would take space meaning it was cars and other private vehicles that would be taken off the quay at that point. He explained that “general traffic” will be taken off the quays by turning left at Blackhall Place, giving the quay over to public transports and cyclists.